You can backup your old photosynth! A photosynth downloader which will let you backup your precious photosynth 1. You can find it on github: dddexperiments/PhotosynthDownloader. 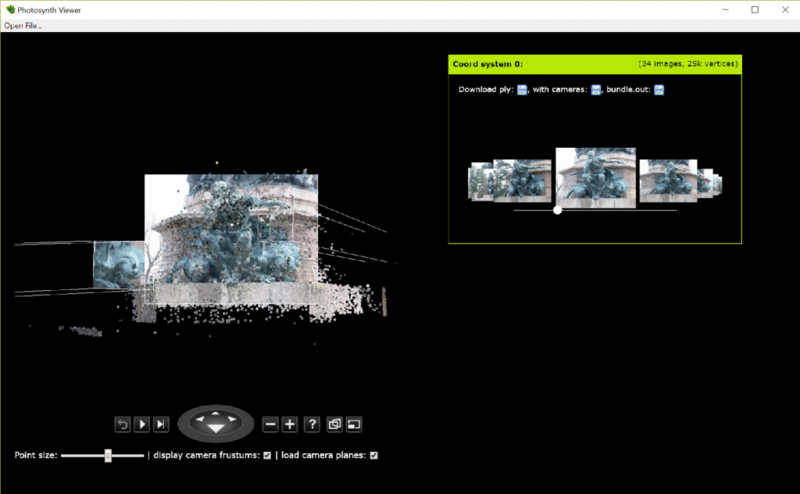 An updated offline viewer which support the photosynth 1 and view them with my experimental webgl viewer, created originally for my chrome extension. The updated source code is available on github: dddexperiments/offlineViewer. BTW if you need a tool to get a list of ps1 to download, I would use the playground of the open-source photosynth2 viewer. You can select photosynth 1 filter (top right) and then use the file render method and csv instead of json for output. Please checkout Nate post if you have trouble using the downloader. Hurry up: you only have 1 month to download your favorite ps1/ps2! Previous Entry: So long and thanks for all the synths! I had a little trouble getting started early this morning but eventually got it to download your test synth. I made some beginner’s notes which may help other people get started using this to export synths. I’m a complete amateur but I have Photosynths on a webpage on our small business website http://www.copplestonesbridal.co.uk/wedding-dresses/ and I have just discovered the Photosynth website is to shut down. Is there anyway that our 3D images can still be seen online on our webpage? Please upload some example dataset. I have lost all synth but would like to have at least one to view. Previous Entry So long and thanks for all the synths!